After nearly two long years, Conor McGregor finally made his return to the Octagon, gracing the cage in what swiftly evolved into what’s expected to be the biggest night in the history of mixed martial arts. After nearly two long years, Conor McGregor finally made his return to the Octagon, gracing the cage in what swiftly evolved into what’s expected to be the biggest night in the history of mixed martial arts. 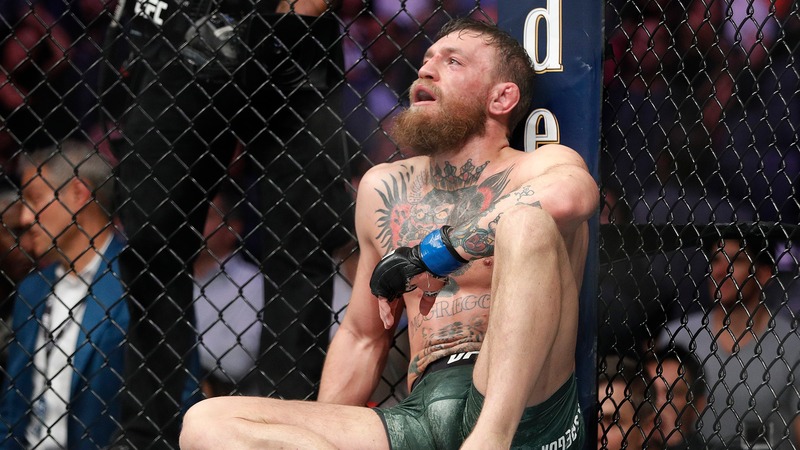 But just as quickly as it evolved into the biggest UFC event in company history, UFC 229 rapidly developed into McGregor’s worst nightmare: the most demoralizing loss of his professional fighting career. After about six weeks of mounting anticipation, McGregor proved to be no match for the undefeated, and seemingly unbeatable lightweight champion Khabib Nurmagomedov. It would only be a few minutes into the very first round before the Russian champion secured a soul-crushing takedown, chipping away at the confidence McGregor had exuded in the two months prior. Round after round, Nurmagomedov took the fight to McGregor, grabbing any limb he could to take the bout into his preferred territory. The Irishman, as many of his supporters feared when predicting Saturday’s outcome, could do little to either prevent Nurmagomedov from taking the fight to the ground, or get back up once it got there. McGregor’s predictable demise came to fruition in Round 4, with Nurmagomedov sinking in a neck crank on the former champion’s jaw that forced the tap. Nurmagomedov’s shocking demise, however, would come just a few moments later. Just as the world was gearing itself to tip its proverbial cap at the newly undisputed champion and his momentous accomplishment, Nurmagomedov lost his cool in biblical fashion. “The Eagle” jumped the UFC’s Octagon and charged at McGregor’s Brazilian jiu-jitsu coach, Dillon Danis. Two of Nurmagomedov’s teammates were then seen jumping into the cage to confront McGregor, swinging at a man who appeared more than willing to accept the crushing defeat that took place just minutes prior. __Contests:__ [Play our free contests to win cash, other prizes](https://betchicago.chalkline.com/games) Both fighters were escorted out of the cage before Bruce Buffer had a chance to announce the victor. The Nevada State Athletic Commission has since withheld Nurmagomedov's fight check, potentially washing away the $2 million he was due to make for simply showing up to the biggest fight of his career, UFC president Dana White announced after the contest. Nurmagomedov’s immediate future is, understandably, murkier than anyone could have predicted. There’s a strong possibility that he’ll be suspended and fined by the NSAC, with his ability to fight in the United States for future events certainly in question as well. White admitted during the post-fight press conference that he wasn’t 100 percent certain Nurmagomedov would remain UFC champion moving forward. McGregor’s future is no easier to anticipate. BetOnline has already released odds for a potential rematch with Nurmagomedov a big -280 favorite over McGregor (+220). Nurmagomedov is also the 5/8 favorite to be McGregor's next opponent with a third fight against Nate Diaz coming in at 13/10. McGregor (5/8) is the favorite to be Nurmagomedov's next opponent at 5/8 followed by Tony Ferguson (3/2). The Irishman is now 23 months removed from his history-making foray at UFC 205 in 2016, and a little over a year out from earning the biggest payday of his professional fighting career in a boxing match with Floyd Mayweather last summer. Whether it was a lack of desire for the fight game or the satisfaction of a stout savings account, McGregor felt it was OK to stay away from the sport for two of his prime athletic years. A loss of this nature, one capable of proving his inability to defeat the most dominant fighter in divisional history, could keep him away from the sport for good. McGregor knew exactly what he needed to do in order to reign victorious Saturday night, just like 26 others before him knew what they needed to do as well. But an understanding of combative tactics wasn’t enough. McGregor was humbled; the career-ending kind of way. McGregor could, of course, lobby for a rematch, just as he did following his first UFC loss in 2016. It’d be a tough sell from a competitive standpoint, but a remarkably marketable fight from the perspective of narrative. Nurmagomedov’s behavior was disgusting; that we should all be able to agree upon. But it’s the same adjective we used to describe McGregor’s dolly-throwing actions earlier this year, and those clips ended up playing a massive role in the anticipation for Saturday’s matchup. The buildup for Nurmagomedov-McGregor II could very well have begun the moment the champion rushed into the crowd. But that’s only if a) McGregor wants the fight, and b) Nurmagomedov isn’t suspended for an extended period of time. Assuming those two variables don’t line up (and there’s reason to believe they won’t), there’s really only one other scenario that results in McGregor making another appearance inside the Octagon: a third bout with Nate Diaz. Diaz will also make his return from a two-year layoff in 2018, making the trip to New York for a co-main event showdown with surging lightweight contender Dustin Poirier. The winner was expected to have a strong case for a shot at the 155-pound title, but Saturday’s events obviously impact the implications of that contest. Given the mystery surrounding the future of the 155-pound title, Diaz could, win or lose, offer his talents for a third crack at the sport’s most popular fighter. It’s a mostly pointless trilogy in 2018 and beyond, but it appears to still have enough steam to recapture the fascination of audiences around the globe for one last blockbuster hoorah for the Irishman. Because after rocketing out of the mixed martial arts stratosphere while capturing two championships in historic fashion, that’s really all that’s left for him: money. The odds of watching McGregor take part in meaningful matchups to climb back up the 155-pound ladder are basically nonexistent, much less the odds of seeing him actually beat Nurmagomedov once he got back to the top of the mountain. Not at this point in his storied career. It’s blockbuster showdown or bust, and Diaz represents the only blockbuster showdown that makes sense.